I noticed this afternoon that the trees are starting to bud. Here in Northern KY we have different trees than I remember having in Southern NJ. 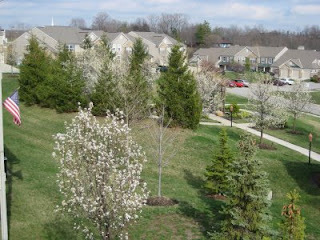 Here the trees budding are flowering pear, flowering crab apple, and red bud. The dogwoods aren't quite ripe yet. In S. Jersey I don't recall those trees, except for the dogwoods. What I remember about the first blooms of spring were the forsythia, crocus, daffodils, followed by lilac, dogwood, and lily of the valley. I remember walking in the "woods" down beyond 7th Avenue on our side of the pike, with my mother, and she would point out the trees by name, the wild plants, by name, and it all went over my head. I wish I had paid more attention. I also noticed that the bulb plants are just about ready to bloom, maybe in a week or so if the warm weather holds. I know this is short, but I wanted to record something I noticed today while laying in bed looking out the huge window wall and just noticing that the grass is now green and the trees are blooming! Thanks for posting! Our peach tree has the prettiest flowers on it. The lilac bushes have budded out now, too. I LOVE spring! Especially this year. We live about 4 hours to the north of you and our first crocus popped out today.